San Francisco airport in 5 hours. Anyways, I am really, REALLY excited about this trip. like him out there who is super sweet and who could tolerate my selfishness. lol. And I know they were humbly and secretlyhoping that we would get married. I know it will mean a lot for them to see us as "married" for the first time. Oh and we have a gazillion plans over there. I think it will be a lot of fun. LOTS of fun. I realized after I am done that mine is 5" x 5". amazed at ALL the amazing coasters.. see? In case I can't blog in a few days.. Thanks again for your time to stop by! Have a wonderful time. This is almost like a honeymoon trip for you.......so enjoy being home. OMG, that big is super cute!! have a good trip. Have a nice and fun time! Enjoy your trip home with your husband. I hope you take it all in and return with great stories and memories of your trip. Have a great time! By the way, my last trip to Texas..I took small scissors, several needles and 3 separate stitchery project plus my knitting and needles for that!! I bet you will be able to stitch. I'm totally jealous! Japan is definitely one of the locations to hit. Have fun!!! Ayumi! you are amazing. Have the best trip ever home! Your family will be so happy I'm sure. And totally scoop up all the fabric you can. :) The coast looks so beautiful. I love that project, can't wait to see them all together. What a lovely coaster that is! And I wish you and your hubby all the best during your stay in Japan...! Have a wonderful trip to Japan! A very happy new year to you and your loved ones!! Safe travels and many, many blessings for a happy, joyous new year! Enjoy!! Have a nice trip to Japan - and happy new year! Feliz viaje!!! Feliz año!!! y gracias por todo lo que nos brindas!!! Muchos besos desde la lejana Argentina!!! Have a lovely time Ayumi! I hope the ii hour plane trip goes *quickly* (and safely) for you! The feelings of coming back your hometown are SO emocional! Have a great visit with your family! Be safe. Safe travels to you and Joe. Enjoy your family time (did you bring an empty suitcase for fabric?). 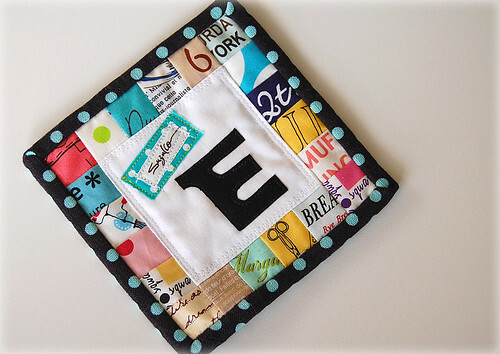 I can't wait to see your photos from the quilt show!!!! Have a great trip and and a wonderful New Year. Querida Ayumi!!!!! Desejo muitas felicidades nessa sua viagem ao Japão!!!! FELIZ ANO NOVO!!!!! Hope you enjoy your time in Japan! hAVe A gREat HoNeYmOOn in JaPaN! Enjoy your trip to Japan! The bag with the ruffle is gorgeous! I hope you have a nice safe trip. My sisters and mom just got back from there after visiting with family on my mom's side and they brought me back lots of treasures (lots of fabric!). They had a great time. 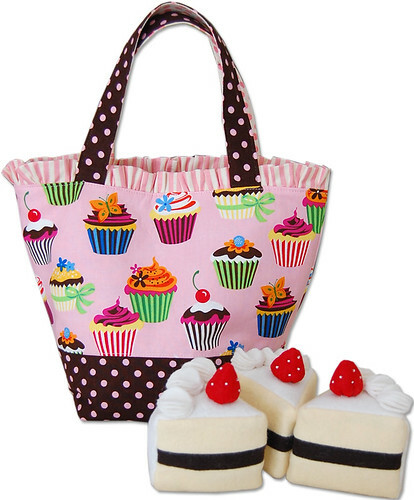 What a beautiful cupcake bag and cakes that don't go straight to the hips - as always amazing creativity! Ayumi have a great trip....enjoy yourself and gather loads of inspiration and share them with us soon! Have a great New Year!